Ham radio is my longest running hobby interest. Things "electronic" caught my attention is a kid on the farm when I was about ten years old. Not quite sure why, unless it was the influence of my grandpa who was the lineman for the small crank-phone system in our part of the county. He took me with him on maintenance calls from time to time and gave me old phone batteries, transmitters, receivers, etc. Using some of that stuff I "installed" an intercom system between some of the buildings on the farm powered by a number of those old nearly-dead batteries in series. I also had an older cousin who messed with radio equipment of some kind. That impressed me too. Then during my freshman year in high school one of the boys club leaders at our church and a ham licensed neighbor each helped me and the boy next door learn the code which led to our novice licenses. Kenny, my neighbor let his license expire but I mostly never looked back after that. The pages that follow are kind of like a lab notebook, showing my approach to each thing discussed and the progression to either my conclusion or when I gave up and accepted the results! In nearly every case I'm looking for something practical rather than theoretical. Hopefully it is informed by at least some theory! I have date/time stamped them with the most recent at the top of each page and on some pages I've given a summery or overall description and some of the references that I found helpful. My hope is that it will be helpful to someone else. First licensed in 1958 as KN0BXB when I was a freshman in high school in Topeka,KS, I have been active except for around 1988 through 2004. Today I work mostly CW on HF. Like to ragchew. I like to homebrew. Also like to play with antennas. Current antennas include an old Hustler 5-BTV vertical and a 102ft G5RV. 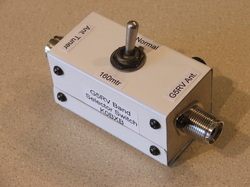 After using the G5RV on 160m a few times I came up with the idea of a switch box to make it easy which was published in the Nov. 2013 QST, page 40. I've recently gotten excited about light weight, packable QRP setups have worked on a number of "stealth" wire antennas. 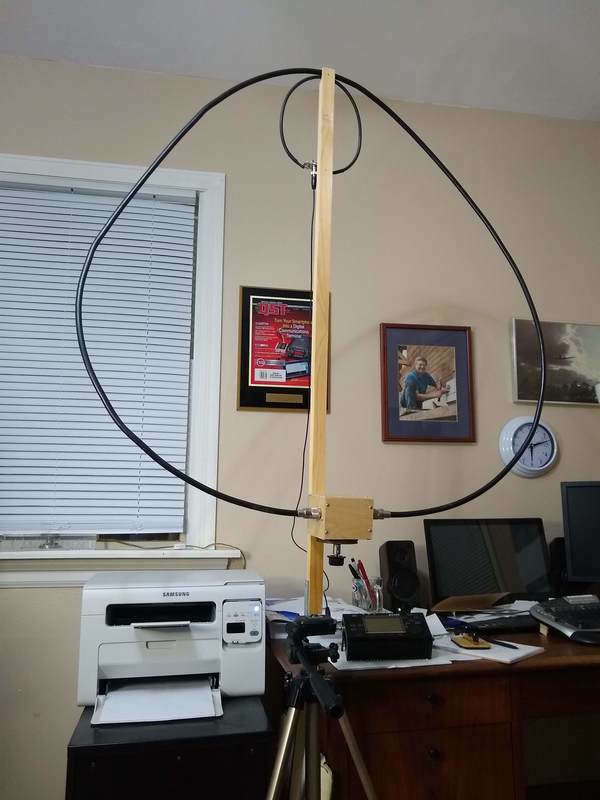 My current antenna project pictured below is a small magnetic loop. My main rig for the past twelve years or so is an Icom IC-7000 but I have a number of others including QRP and vintage pieces. My favorite vintage transmitter is a 1940's Millen 90800 (pictured here in the upper left corner of the photo), just like the one I had back in the 50's as my first transmitter. I have successfully tied the WA1FFL Direct-Digital VFO (http://www.wa1ffl.com/) to the Millen which makes it a lot more versatile, if less authentic! I can still make it chirp wonderfully with the several FT-243 crystals I have. But I guess for true authenticity I should use the old Bliley CM2 7040khz crystal a local friend gave to me (shown below). As he described, it does look more like an Oreo cookie than a crystal! My favorite homebrew rig is a little one tube transmitter built on a wooden slat chassis first described in the Dec. 1946 QST magazine using a single 6V6 tube. It puts out 3-4 watts CW on 80 and 40 (40 by design but I'm sure the second harmonic when on 80 is nearly as strong!) and the crystals sing a nice tune - not the boring monotone of modern rigs. It would be hard to imagine a more basic transmitter. After years of thinking about it, I finally made my own homebrew straight key from scratch a few years ago (see photo below). I used the measurements from an old WWII Speed-x key. The contacts are from a retired relay. The spring is a badly worn hacksaw blade. I'm pretty happy with the way it looks, and it even works! I graduated with BS in electrical engineering in 1967 but worked the last 48 years in various capacities, some technical, with Wycliffe Bible Translators and affiliates, retiring in late 2018. In the 1970's I held one of only two active ham radio licenses in Ghana in West Africa while serving there. Here is my "pride and joy", a 1940's Millen 90800 exciter/transmitter. In high school my Dad bought one for me from a nearby ham as my first transmitter. I'm still amazed that I was able to get it on the air! During my college years that one disappeared (I think my mother sold or gave it away at a yard sale though she has always denied that!). I have been on the lookout for one for many intervening years and finally found this one on eBay. It uses a 6L6 oscillator and 807 final. I don't use it often but every glance at it brings back wonderful memories and a sense of appreciation for the wonderful gear we have available today. You can see that Bliley CM2 7040khz crystal I mentioned above in the lower left of the transmitter. This little 6V6 based transmitter was a really fun project, partly because it is so simple but mostly because of my childhood memories of it. I wanted so much to build one when I was in high school but just couldn't figure out how. So when I saw it in a QST article in 2011 I had to do it. An article I wrote about the experience was published in the November 2012 QST pages 46-48. I was flooded with responses. Turns out I was not the only one who either wanted to or did build it many years ago! Home made straight key. Based on measurements from a WWII Speed-x key given to me by a WWII Vet in Florida. The contacts are from an old relay and the spring is a re-purposed hacksaw blade. The wood was from an old bookshelf. Works well, though I prefer the real Speed-x key for normal operation. It's action is just not as "clean" as the Speed-x. But I keep it prominently displayed on my desk. 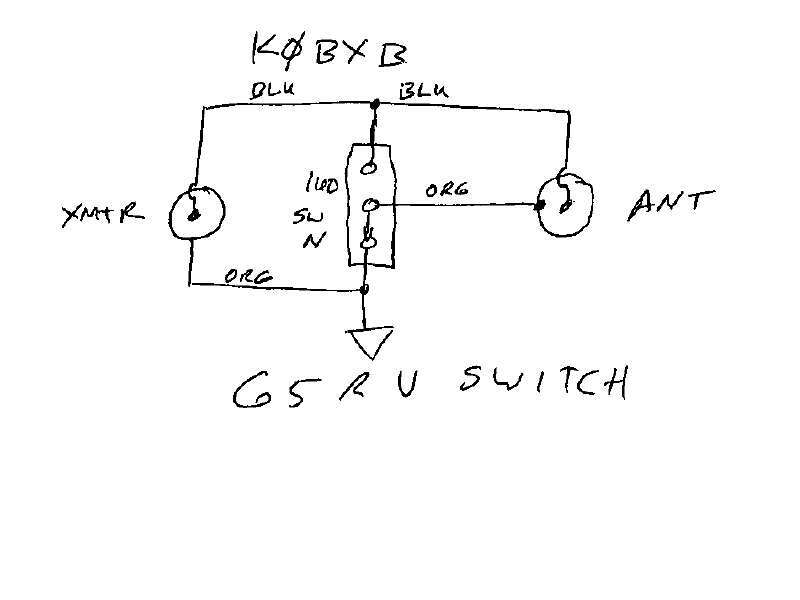 G5RV switch. It has been common knowledge for years that you can use a 102 ft. G5RV on 160 meters by simply tying both legs of the feed line together and driving it like a vertical against a ground system. But that is such a hassle that most of us don't bother. I tried it a couple of times and enjoyed 160 so began thinking of a way to make it simple. The box at the right is the result. It consists of nothing more than a switch and a couple connectors. Now to use the G5RV on the regular bands I put the switch in the "normal" position and to operate on 160 simply flip the switch. It is so nice to be able to use 160 with no hassles. QST Magazine liked the idea and published it in the November 2013 issue. For the record, I do not have any special ground system and it works to my satisfaction. Perhaps the house ground system is helping me since it is tied together with my shack ground. 1/28/15 I have been pleasantly surprised at the interest in this little switch. Since writing the article for QST and as a result of questions from potential users I have simplified it by using a SPST switch. Why I didn't see this initially I don't know. Anyway, here is the schematic of the simplified version. I hope it is helpful to someone. The switch clearly has encouraged some people to get on 160 which was the whole purpose of the article in the first place. One guy even used it to get his G5RVjr antenna on 80 meters. Small Magnetic Loop tuning 30, 20, 14, 15, 12 and 17 meters.